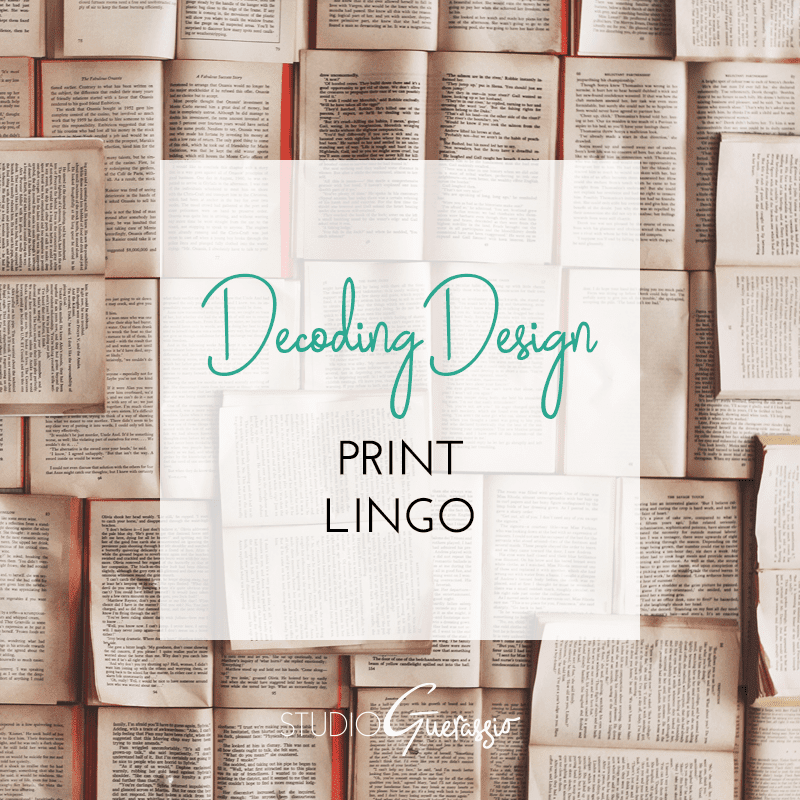 Having covered color profiles and website lingo (catch the full Decoding Design series here), I will now move on to the wonderful world of print. If you’ve ever had to deal with getting something professionally printed, and are not yourself a printer or designer, you’ve probably been befuddled by terms like DPI, and possibly worried about mention of bleeds and stocks and crops. Not to worry; taking something to print is, usually, a painless and bloodless process if you’re properly prepared and know your print lingo. Dots Per Inch, or PPI: Pixels Per Inch. If you have ever heard the term ‘resolution’ in regards to image quality, this is what it meant. DPI refers to the dot density of an image when it is reproduced as a real physical entity, i.e. printed onto paper or displayed on a screen. In other words, dots per inch is literally a measurement of how many pixels or dots of ink fit in a line 1 inch long. This makes a difference, because generally the higher the DPI, the crisper and better-quality a printed image will be, and the larger you can print an image without losing quality or having it become pixelated. Standard resolution for online or web images is 72 DPI, wheras the minimum standard for printed images is 300 DPI. You can discover the resolution of an image by opening it in a program like Photoshop and bringing up the Image Size window (it will list DPI), or you can ask your designer if an image is of the required resolution for your project. Have you ever printed something small out on a letter-sized piece of paper, but then when you went to cut it out the scissors couldn’t quite get close enough and you end up with that plain white paper smidgeon of a border around your piece? Well, bleeds and crops are the professional printing world’s way of eliminating that unsightly problem. Professional printers use large format printers, so unless your project is also pretty large, there will be some trimming to remove the excess plain paper and get your piece to it’s actual finished size. To eliminate the possibility of that excess white border, designers set up print pieces to include a bleed – generally 1/8″ to 1/2″ of extra color or picture information that extends beyond the edges of a piece. This bleed ensures that even if the trim line isn’t exactly perfect, you just have a continuation of your design instead of that annoying border of plain paper. A crop mark is a designation that tells a printer where the actual piece ends and the bleed begins – i.e. where they should crop/trim the paper at. Traditional printing presses run pieces through the press one ink color at a time. This means something printed in CMYK (4-color process) runs through a press 4 different times, once for each color. Registration is the method printers use to make sure the paper (and hence the printed colors) line up correctly for each color run through the press. Printers place a special mark at the edge of the press sheet and use that for alignment. In the printing world, stock refers to paper stock. Choosing a specific paper stock for your print project sounds like it would be as simple as saying ‘plain white paper’, but it’s actually a bit more complicated than that. Paper types vary greatly by material they’re made from, finish, weight, and color. Even with plain white paper, you have the options of a cool white, or warm white, or bright white; a matte finish or gloss finish or satin finish; vellum paper, recycled paper, fiber paper, textured paper; thin lightweight paper or thicker cardstock paper. The choices can be overwhelming, but choosing the right paper to print your piece on can really enhance the finished product. Your designer or your printer can look through paper sample books with you until you find one that you like. What are some print terms that have baffled you? I’ll do my best to de-mystify them.